A referendum on Brexit is clearly possible. But the details matter, and contingency planning should start now to ensure that any such referendum is viewed as legitimate. These are the key conclusions of a new Constitution Unit report written by Jess Sargeant, Alan Renwick, and Meg Russell. 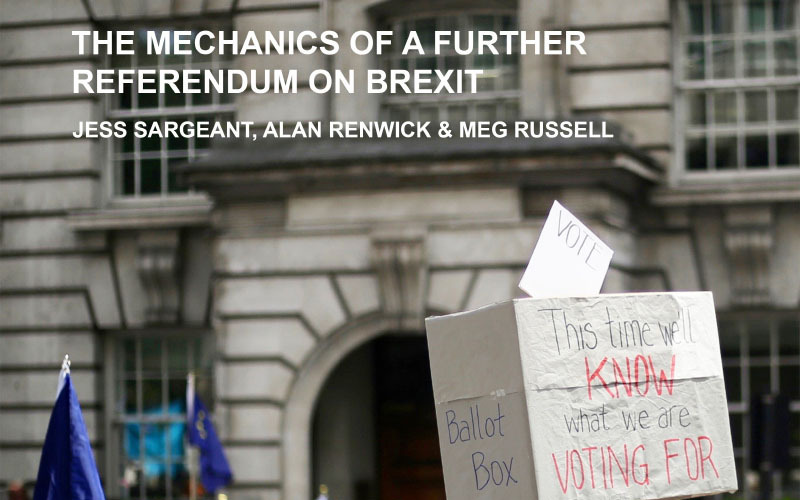 The report titled The Mechanics of a Further Referendum on Brexit highlights the constitutional and legal questions that must be considered, including: the timeline, how a referendum could be triggered, the format of the question, and what rules should govern its operation. The report takes no position on Brexit or on whether a further referendum should be held, but seeks to inform debate about the practicalities. A new referendum requires legislation: ensuring proper scrutiny of this, and adequate preparation for the poll would take at least 22 weeks. This would demand an extension to the Article 50 period, which should be achievable – but does open up some complications, particularly regarding the European Parliament elections due in May 2019. There are various trigger points for a referendum. Parliament could demand a referendum in return for approving the government’s deal with the EU, or impose it in the event of ‘no deal’ to avoid the UK crashing out without a deal. Some politicians have advocated a ‘yes/no’ referendum on the deal, but this would be unwise. The report also dismisses a two-stage poll, as some others have proposed, and concludes that a ‘deal’ vs. ‘no deal’ poll is unlikely. Three question formats are more viable: ‘deal’ vs. ‘remain’, ‘no deal’ vs. ‘remain’ (if no deal is reached) or a three-option poll on ‘deal’ vs. ‘no deal’ vs. ‘remain’. The franchise for a referendum should be the same as in June 2016, to avoid the risk that a changed franchise alters the result. Referendum regulation should be updated to account for online campaigning. Five scenarios for a referendum are set out, with a first possible polling day in May 2019. The report is co-published with the UK in a Changing Europe programme. The research was funded by the JRSST Charitable Trust. “In the British system anything is possible given the political will. The current level of interest in a further referendum on Brexit makes it vital that serious consideration is given to all possible scenarios, including which would work best and which would be most problematic. As events remain unpredictable, and may unfold quickly, it is possible that politicians will need to take rapid decisions, and we hope that our report can guide sensible and responsible decision-making." Alan Renwick and Meg Russell will present and discuss the report and its findings at a seminar at 6.15pm on Thursday 11 October in the JZ Young Lecture Theatre, Anatomy Building, UCL. Details of the seminar and registration are here.